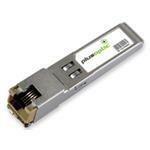 Te plusoptic alcatel-lucent compatible sfp-t-gfe-alc has a data rate of 10/100/1000mbps and a range of 100m on copper utilising an rj-45 connector.as with all plusoptic products, the sfp-t-gfe-alc is manufactured in state of the art, iso 9001, dirt and dust free manufacturing facilities. we ensure that all plusoptic products are made with only the highest quality lasers and componentry, under strict manufacturing practices and rigorous testing to ensure that all plusoptic products are of the highest possible quality. the sfp-t-gfe-alc has a full 3 year warranty and a 100% compatibility guarantee. if you require fibre patch leads to connect your sfp-t-gfe-alc simply browse through the cables section on our website. if you have any questions about the alcatel-lucent compatible sfp-t-gfe-alc or the cables required to connect your network please contact you distributor or our friendly team as we are always happy to assist. we are also able to supply a datasheet for the vendor compatible sfp-t-gfe-alc if you are after more detailed information about the product, simply contact us to request a data sheet.